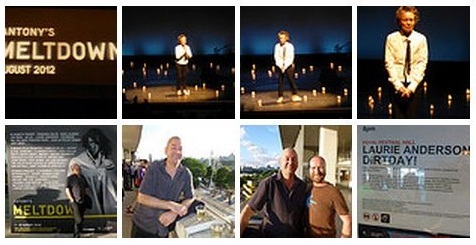 A few weeks ago Paul and I went to see Laurie Anderson perform Dirtday! as part of the Antony Hegarty curated Meltdown festival at The Royal Festival Hall on London's glitzy South Bank. The third and last in her series of solo story works, which includes Happiness and The End of the Moon, Dirtday! is the culmination of Anderson's ground breaking work in this genre. Dirtday! sees Anderson present her views on politics, theories of evolution, families, history, and even animals. Set against a detailed and lush sonic landscape, the powerful and soulful collection of songs and stories create a unique picture, a hallucinatory world made of dreams and reality. We simply loved it.